A rounded, silvery-gray desert shrub growing a foot and a half to about three feet tall. The light-colored leaves, produced by salt in the plant, are an adatation to reflect sunslight and reduce its need for water. The distinctive, twisted, toothed leaves on the plant provide an appearance resembling the European holly but they are not related. Shrub 3–10 dm, rounded, silver-scaly. Stem: simple proximally, erect; branches many, spreading to ascending. Leaf: petioled, blade 12–45 mm, wide- ovate to round, thick, irregular-sharply dentate. Pistillate inflorescence: occasionally terminal; bracts in fruit sessile to short-stalked, free, 6–15(20) mm, round to ± reniform, entire to ± crenate. Desert tortoise and Mojave fringe-toed lizard have been seen here. 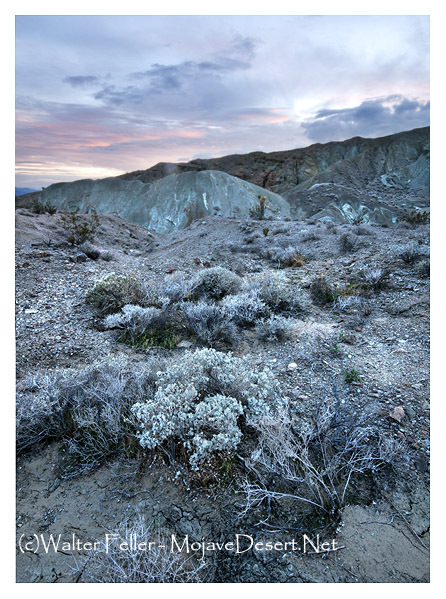 Creosote, desert holly and scale scrub plant communities prevail throughout this area. Desert-holly series, Elephant tree stands, Mojave yucca series, Nolina series, Ocotillo series, Teddy-bear cholla series, White bursage series. The most flourishing shrub was the desert-holly with gray, frosted leaves shaped exactly like the leaves of Christmas holly, and small lavender berries.